I was feeling inspired by Mandy’s creation last week, so I set out to do a bit of Christmas baking. In my family, we don’t go crazy with Christmas gifts anymore. We tend to give small handmade gifts or something consumable. For years I gave everyone handmade soap, but I have branched out in the last few years and done a bit of baking, and preserving. I was attracted to these cookies because I had never heard of putting tahini in cookies; I usually associate this ingredient with savoury dishes. Curiosity won out and I made a batch, to check them out. Well, I really liked them, so here they are today, and don’t tell anyone, but I will be including them in my Christmas packages this year. I will also be bringing a big plate of Tahini Cookies over to the gang at Angie’s Fiesta Friday. Hopefully everyone there will enjoy them and maybe feel inspired to include them in their Christmas baking too. Thanks so much to Angie of The Novice Gardener and all of the gracious co-hosts for continuing to host this awesome virtual blog party week after week! I found this recipe in the November 2014 issue of Bon Appétit magazine. Tahini in cookies?? It really works! Pulse the first 6 ingredients in a food processor, until the dough forms a ball around the blade. Mix sesame seeds and sanding sugar together in a small bowl, and set aside. 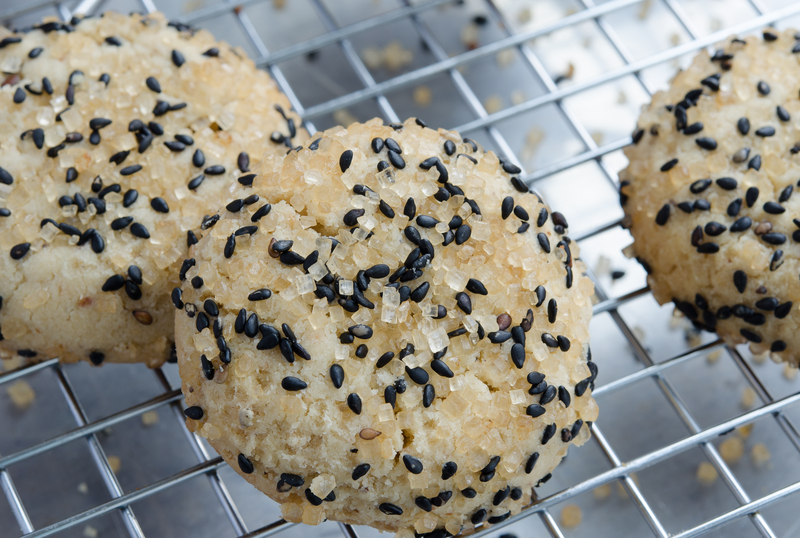 Form dough into 1-inch balls and roll in the sesame mixture. Place the balls on a parchment-lined baking sheet, spacing about 2 inches between each cookie. Flatten the cookies slightly with a fork. Bake until lightly golden brown, about 20 – 25 minutes. 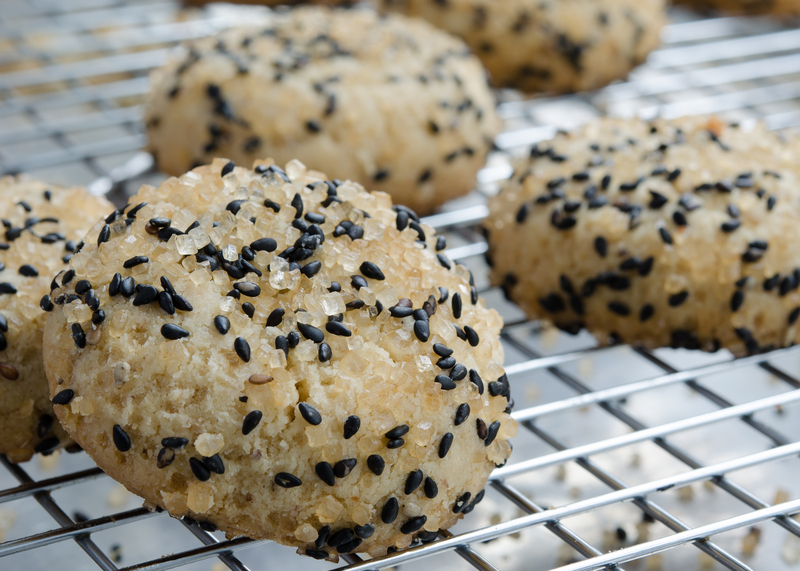 Black sesame seeds add another exotic touch to these cookies. 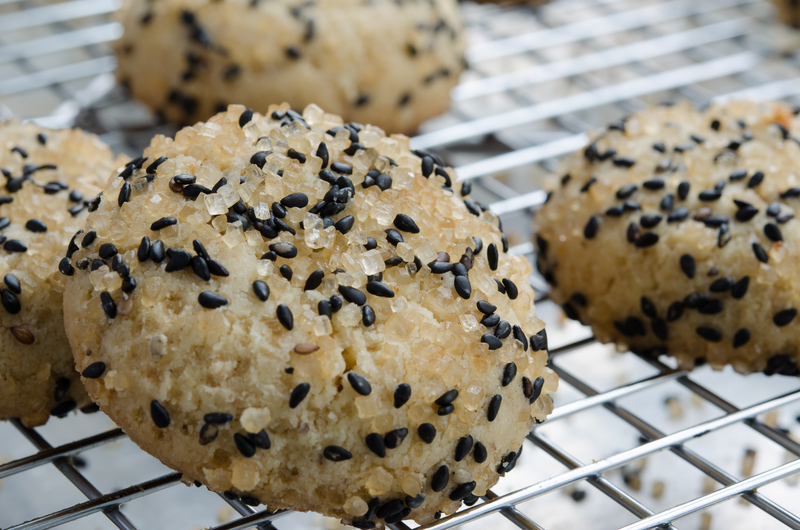 Those look so pretty with the sugar and black sesame seeds on them. I find cooking with tahini is a lot like using peanut butter – sweet or savoury – it’s all good! YUM YUM YUM YUM!!!!!!!!! tahini is the BEST!!!!!! yummy!! These are very different than the cookies I normally see… I never heard about them before, but it certainly look great! Can I use coconut sugar instead of coarse sanding sugar? Interesting. I have only had tahini in hummus but have a big jar and all other ingredients…..ummm might be branching out! I love the going away feom the commercialization of Christmas in your family Juliana. The way it should be! Anyone lucky enough to receive one of your Christmas packages is going to be mighty pleased! Such an interesting looking cookie (I can’t help but think of a porcupine, hehe) and I imagine the flavors are unique and delicious! I always receive a food education from you, Julianna… Thank you! Wow! Exotic cookies and made without any baking powder and soda..absolutely stunning. I just love seeing recipes for things I would never think to put together and then see how delicious it looks and tastes. Tahini cookies are amazing! love the decoration you made with black sesame and sugar! Thanks for being at FF! I love tahini in cookies, there is a natural health food store in Oregon that makes a huge batch of the stuff, you bring a jar and pay for what you buy, it is delicious! These cookies look delicious! Never tried tahini in cookies, but they sure do sound amazing! 😀 Happy Holidays! yummm…lookin’ good! I love tahini, what a great idea to make cookies with it.